Lucas Punkari/Daily Herald Mason Harris avoids a tackle attempt during a practice for the Carlton Crusaders football team Wednesday. Although classes don’t start until after Labour Day, local high school football players are already getting back into the swing of things. 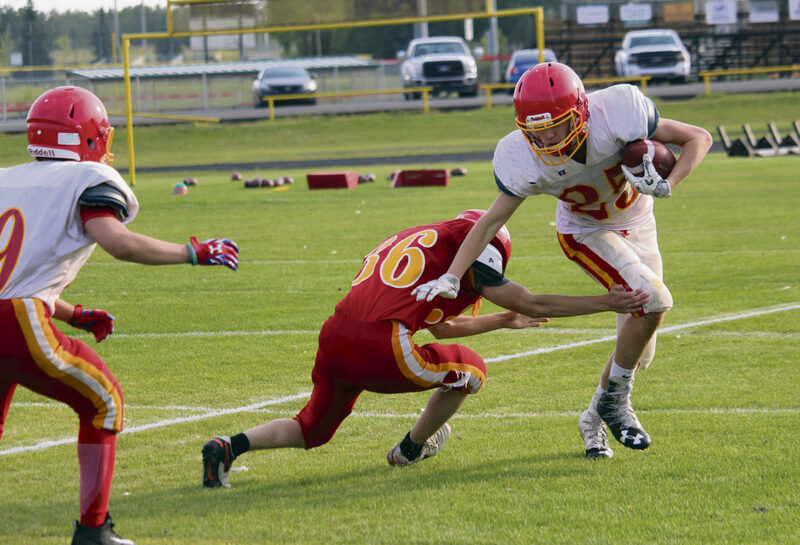 The Carlton Crusaders and the St. Mary Marauders both opened up their 2018 training camps this week, as they get ready to start off their Saskatoon Secondary Schools Athletic Directorate regular season schedules next weekend. Last season saw the crosstown rivals square off in the SSSAD Division III championship game, which saw the Crusaders come away with a 25-22 win at Max Clunie Field. “As an athlete, you want to finish off the year by winning your last game,” Strachan said. “It’s something we’ve been able to do for the last three years now, and that’s always a huge positive for us. Quarterback Kyle Witkowski prepares to launch the ball down the field Wednesday during a St. Mary Marauders practice session. Meanwhile, the Marauders were left to wonder what if after their loss to the Crusaders in November, as it brought a sour end to a season with high expectations. “It was a pretty disappointing year,” Hundeby said. “We had a veteran team with a lot of talent, but we certainly underperformed down the stretch. After a controlled scrimmage between the two sides at Max Clunie Field Friday at 4 p.m., the Marauders will open up their regular season schedule on Thursday, Sept. 6 in Saskatoon against the Walter Murray Marauders. Meanwhile, the Crusaders will kick off their campaign the following night at Max Clunie Field against the Bethlehem Stars at 6:30 p.m. When it comes to the 4A SSSAD league this season, both coaches expect the usual suspects to be leading the way. The Centennial Chargers ended the Holy Cross Crusaders’ seven-year reign at the top of the 4A league last season with a 34-28 overtime triumph in the championship game. The Chargers would then fall in the provincial title contest to the Campbell Tartans of Regina.